The simple, humble steamed clam or mussel is a delight either eaten by itself or used as an ingredient in dishes. This basic technique will work with any variety of live clams or live mussels. 1. Optional: For extra flavor & color as well as a creamier texture, flour soak mussels before steaming them (how to prep mussels). 2. Heat a thin layer of oil in a coverable wide pan. 3. Add some finely chopped shallots and sweat until tender (what is sweating vs. sauteing?). 4. Lay in your clams or mussels. 5. Pour in enough white wine to coat the bottom of the pan. 6. 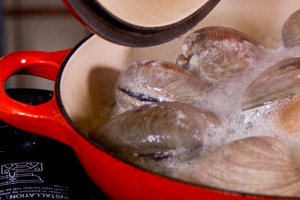 Cover the pot and cook just until the shellfish have opened (the amount of time depends on the type & size of shellfish used). Be careful not to overcook them, lest they become tough. Discard any that refuse to open. 7. Strain the liquid in the pan through a fine mesh sieve or chinois & reserve for use in soups, pasta dishes, etc.